The minimum age requirement is 25 years of age. A valid driver’s license, proof of full coverage car insurance or vehicle rental insurance, and a major credit card (we accept MasterCard, Visa, and Discover) We do not accept prepaid credit cards or checks. Is there a fee if I cancel my rental? Yes, there is a $20 cancellation fee if you cancel within 24 hours of your scheduled pick up time. Your credit card will not be charged if you cancel up to 24 hours in advance of your designated pick-up time. Can someone else drive the vehicle that I rent? Yes. Additional drivers must meet all qualifications as the primary drivers in regards to age, license, and insurance. This information must be provided prior to or at pick up. Payment is due at time of rental pick up. At that time $200 hold will be put your credit or debit card, or a $200 cash deposit will be accepted. This money will be refunded upon the return of your rental if there are no issues. Any additional fees will be assessed upon a detailed inspection. 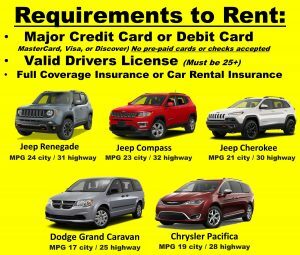 Will Lakeshore Chrysler Vehicle Rental pick me up? We do offer local pick up M-F, let our rental specialist know your location to see if you qualify for local pick up. Do you sell extra insurance if I do not have full coverage insurance? No, but we suggest you check with your insurance company or credit card company about your existing coverage or adding rental car coverage for your rental dates. We suggest using Allianz travel insurance, 1-866-726-1746 or allianztravelinsurance.com. Do I get a refund if I return my vehicle early? If you return the vehicle early we do not give a refund for the unused portion of your rental. What if I return my vehicle late? Late returns of 180 minutes or more will result in another day’s rental charge and a $25 per day late fee. $40 per day fee applies if you do not call to inform us. What if I am late to pick up my vehicle? We will hold your vehicle for 120 minutes after the designated pick up time. 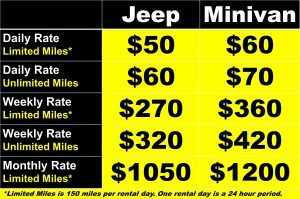 If we you do not contact us during that time we will rent the vehicle to another customer and there will be a $30 no show fee charged to the credit card on file and will will rent out the vehicle to another customer. What if I return my vehicle after business hours? We do have a drop box for keys if you are returning your rental vehicle after hours. The vehicle will be assessed the next morning for any damages. If any damages are found, we will inform the renter of our discovery and charge their credit card or contact their insurance company appropriately. For assistance please call 1-800-521-2779. Call us immediately. If it is after hours call our roadside assistance number and have it towed to the nearest Chrysler dealership. All our vehicles are covered under warranty. Do you charge to refuel the vehicle? Yes. Vehicles must be returned with the same amount of fuel as at the start of the rental to avoid refueling charges. Refueling charges are $5.00 per gallon. Are their geographical restrictions on where I can drive the rental vehicle? Yes, our rental cars are not to leave the United States. Only service animals used by members or passengers with disabilities are allowed in the vehicle. Please return the vehicle free of pet hair. Pet hair on the seats may result in a cleaning fee. Can I use my rental vehicle to haul? What if I forget an item in the vehicle? Found items will be held in our lost and found for 30 days. We are not responsible for lost or stolen items. Is smoking or vaping allowed in your vehicles? Smoking and vaping is prohibited. Vehicles are inspected upon return for a number of items, including evidence of smoking and vaping activity such as: smoke, ashes, cigarette butts, burns, etc. Can I take my rental vehicle off road? No. Our rental vehicles are not to leave maintained roads that are regularly and openly traveled by the general public. What if I get a citation or a toll violation? The renter is responsible for the payment of these charges. Some municipalities have adopted video radar services, allowing for moving violations to be captured by camera. The owner is identified by the license plate and notified by mail and billed for the infraction. As per the terms of the rental contract, these charges are billed to the credit card on file. In the case of an accident the local police should be advised and a police report completed, and the full details of the 3rd party should also be taken. You will need to complete a full accident report form when returning the vehicle. It is important that you retain a copy of all documentation for your own records. Please keep a copy of your insurance with you during the duration of your rental in case of an accident. Who is responsible for damage to the rental vehicle? The renter is responsible for all damage to the rental vehicle.